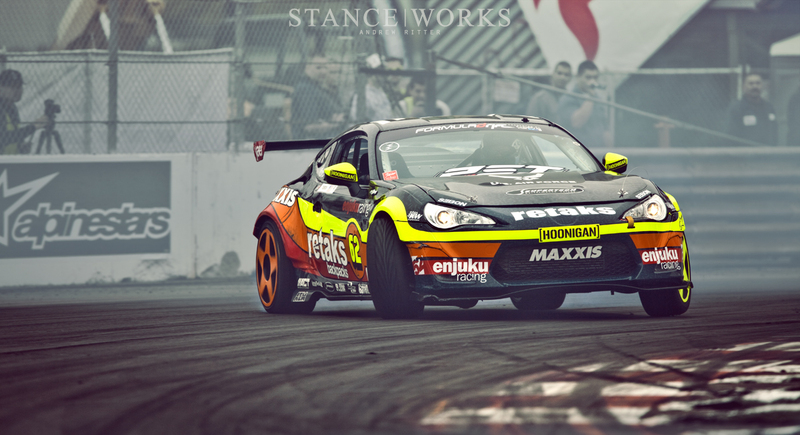 Formula Drift has returned for its 10th year, a major milestone for the series. New cars, new drivers, and new courses are thrown into the mix with some of the decade veterans and venues that have brought the series to where it is today. Round One in Long Beach, California marks the first event of the season, and as always, the adrenaline was non-stop and the crowd was larger than ever. Friday began with qualifying, which has been radically changed by the judges for the new season. In an effort to up the competition, drivers must go all-out on their first qualifying run. The top 16 scores are now locked into place after just one run, and the remaining 16 places are up for grabs to any driver who failed to make the cut. With just 32 spots in total up for grabs, the rivalries are more intense than ever before. With such intense competition, drivers Justin Pawlak and Matt Field both put their cars into the wall during qualifying. However, both managed to re-assemble their cars and land themselves positions in the bottom half of the bracket. 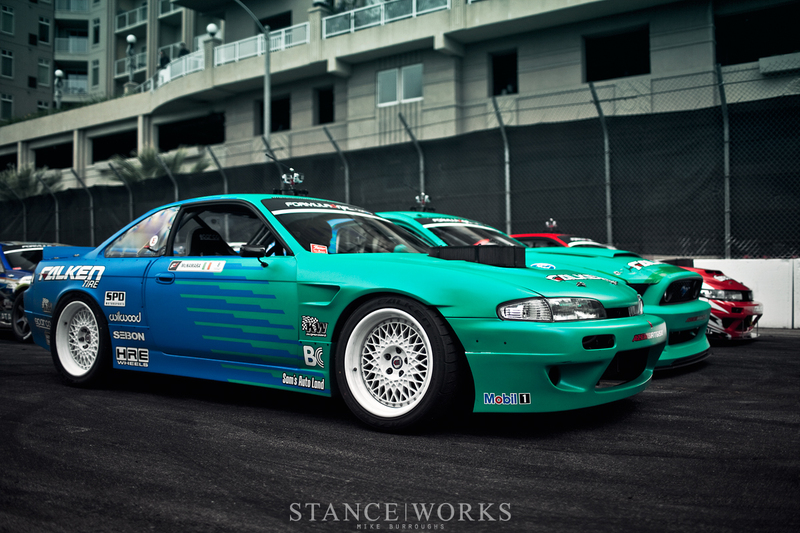 Among the other contenders to make the top 32 was Matt Powers in his re-liveried S14. 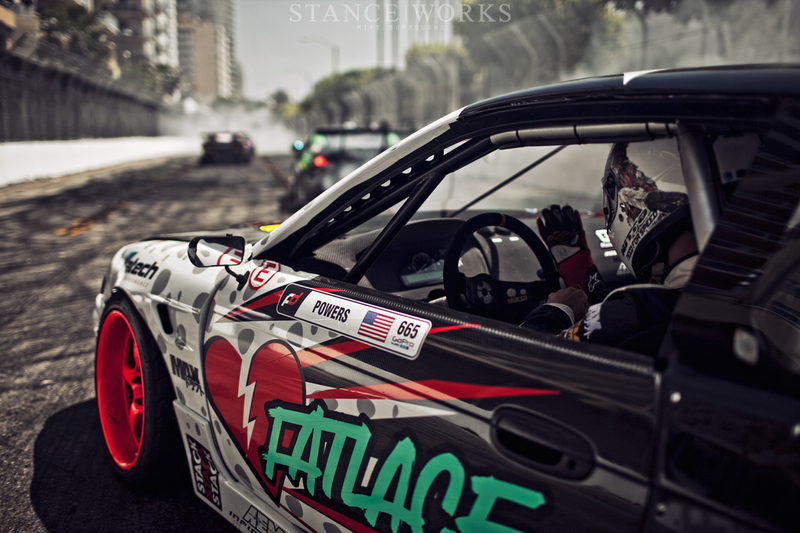 Need For Speed is no longer his main sponsor, and instead, Fatlace has come to the table to design what is, without question, my favorite livery on the track this season. His LS-swapped S14 is also putting down more power than ever too - almost 700 horsepower. 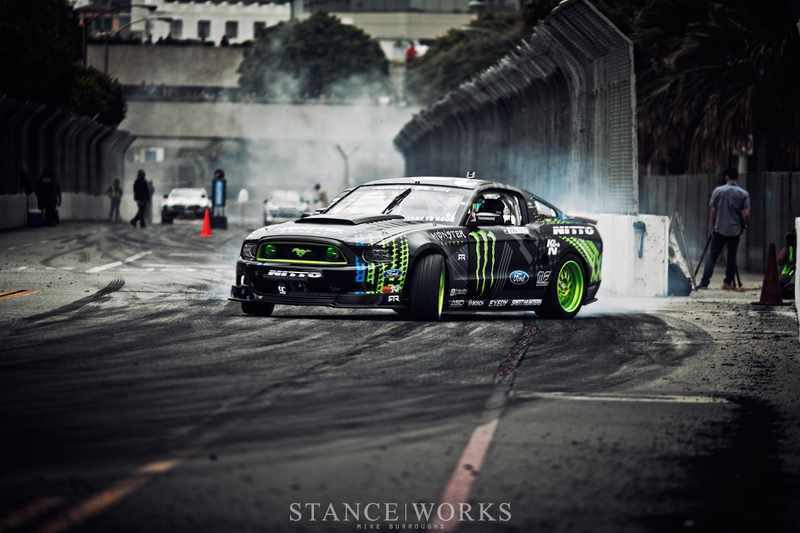 Nitto is still his tire sponsor, and added to the Nitto fleet this year is Vaughn Gittin Jr and his Ford RTR Mustang. 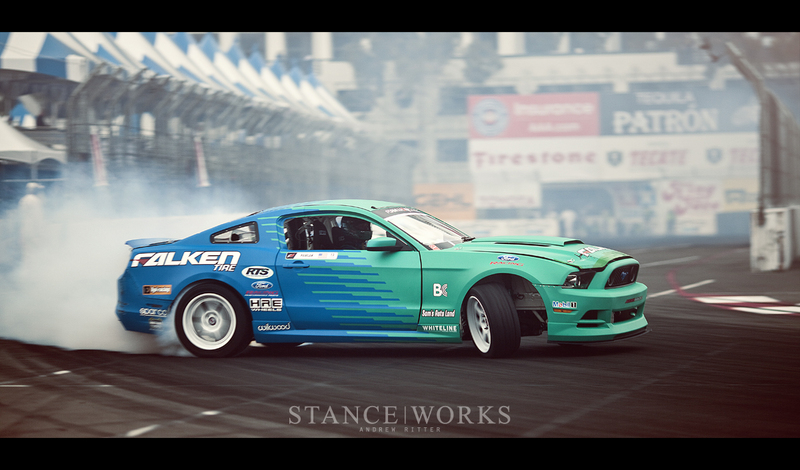 Re-liveried by Vaughn himself, Falken tire is no more. Instead, NT05s are now the rubber of choice, and the new partnership seems to be off to a killer start, with Gittin qualifying for 6th place. Bil Baldwin is back, playing crowd favorite and secondary entertainment as the fearless track worker. Close calls were as prevalent as ever, and as always, Bil never flinched in the least. 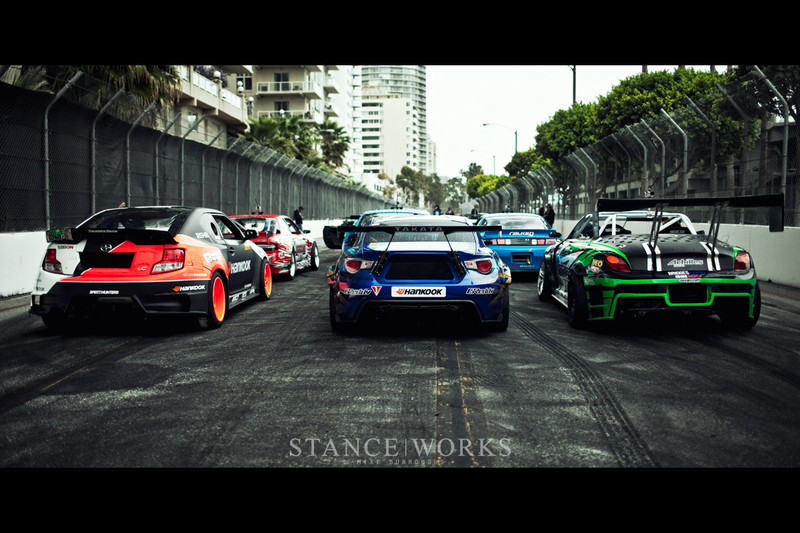 Several other cars met the wall throughout the weekend, as Long beach is notorious for. 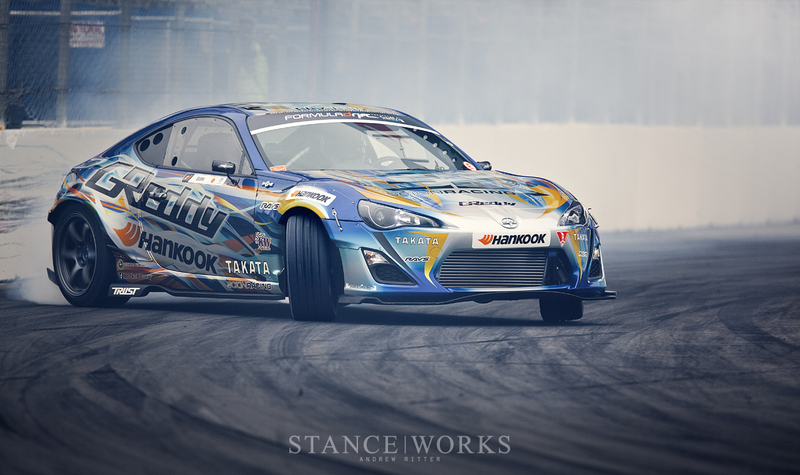 Ken Gushi was out in full force in one of several FR-Ss on track this season. the new Greddy/Hankook livery was an absolute joy to look at and photographed unbelievably well. The boxer engine pumpes out a staggering 530 horsepower, a demonstration to show what the little boxers are capable of with some work. 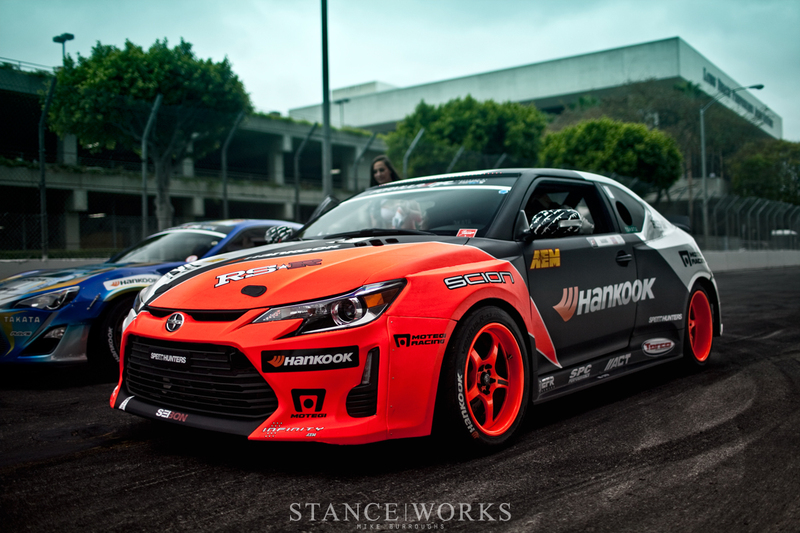 Also in an FR-S this season is Ryan Tuerck, having left his S13.5 behind. The FR-S was bought by by the team off the showroom floor just months ago. 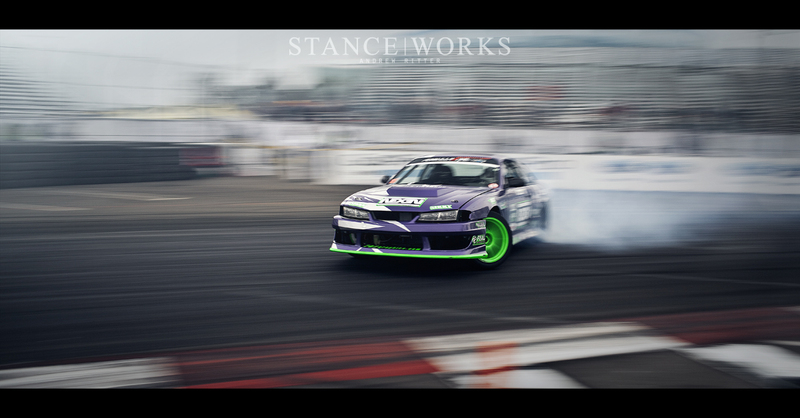 Portland Speed Industries transformed the car into what Ryan considers the best car he's ever pitched sideways. Powered by a 2JZ, the Rocket Bunny FR-S shreds rubber with almost 800 horsepower - a leap above and beyond his Gushi counterpart. Retaks is back as his primary sponsor, with Maxxis tires wrapping the Fifteen52 Tarmacs to creat another one of the best looking cars of the season. The sun began to fall on Friday, with the qualifiers set in place and the top 32 knockout just hours away. Mike Essa returns this season in a turbocharged E46 built by GSR Motorsports. With a widebody from DTM Fiberwerkez and 750 horsepower, the E46 is substantially more aggressive than the Z4 he had used in past seasons. Race day rolled in with thick and heavy cloud cover, and a slight drizzle kept the morning interesting during practice runs. 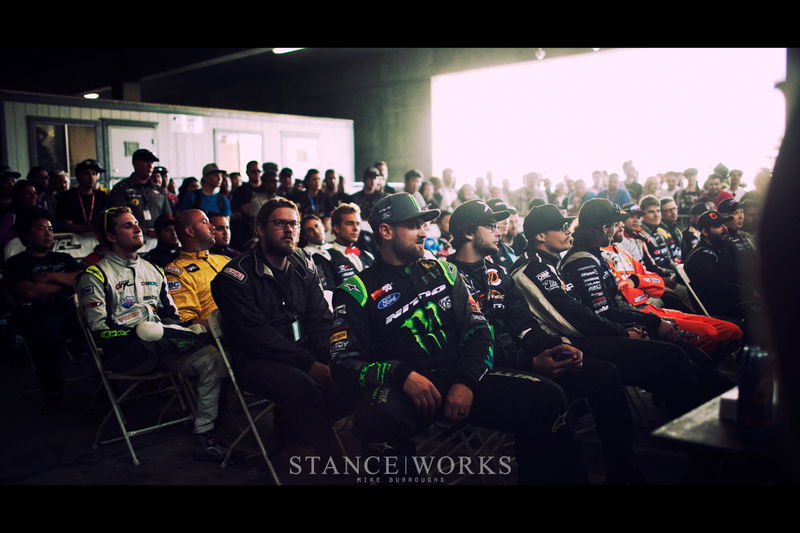 In the driver's meeting, the remaining 32 drivers were briefed for the day and mentally prepared for the first race of the season. The Top 32 Knockout began with a serious bang. 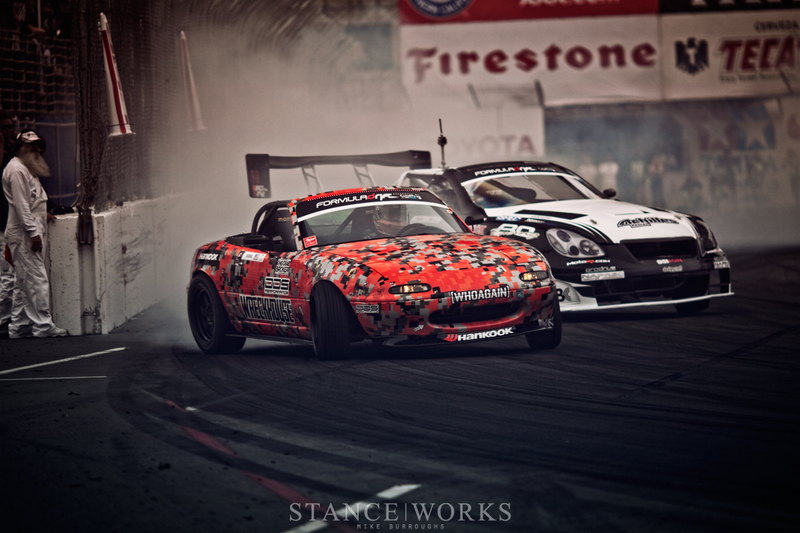 2012 champion Daigo Saito and his 1200-horsepower Lexus SC430 were paired against Danny George and his V8-powered Mazda Miata. It was lion versus sheep in a fight that the entire crowd expected to see Daigo win without a lick of effort. However, a few slip-ups on Daigo's behalf gave Danny a fighting chance. However, it wasn't enough, and Saito moved on. The Top 16 had rolled around in no time, with group consisting almost entirely of the expected big names, with a few outliers such as Odi Bakchis and his rebuild S14. 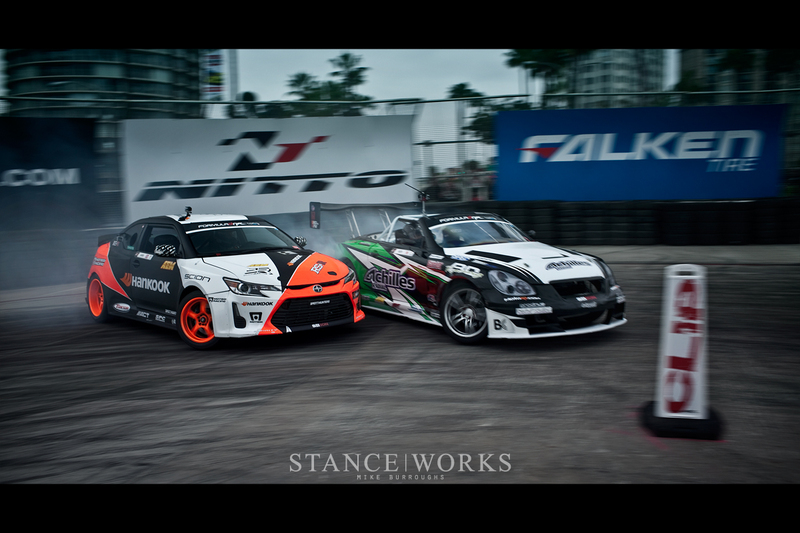 However, he was knocked out by Kenny Moen and the Lutz Performance 350Z. Moen was later knocked out, unfortunately by himself, after sending his car in to the wall in a battle against Chelsea Denofa. 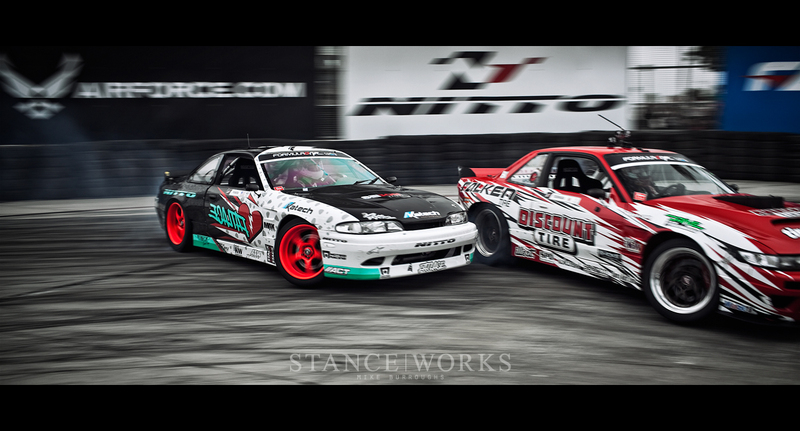 Matt Powers was knocked out early in the top 16 fight against former champion Dai Yoshihara and the Discount Tire S13. 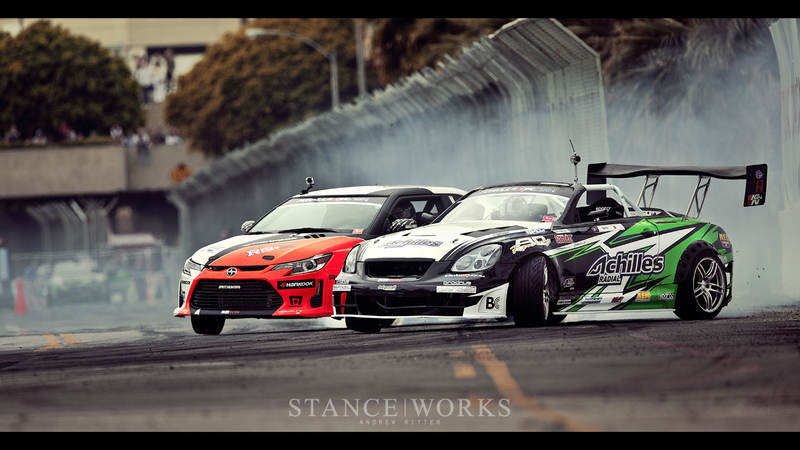 Ken Gushi managed to knock out Mike Essa, who seemed to be on a roll to start the season. We had hoped to see his BMW finally land him a podium, however, luck wasn't on his side. 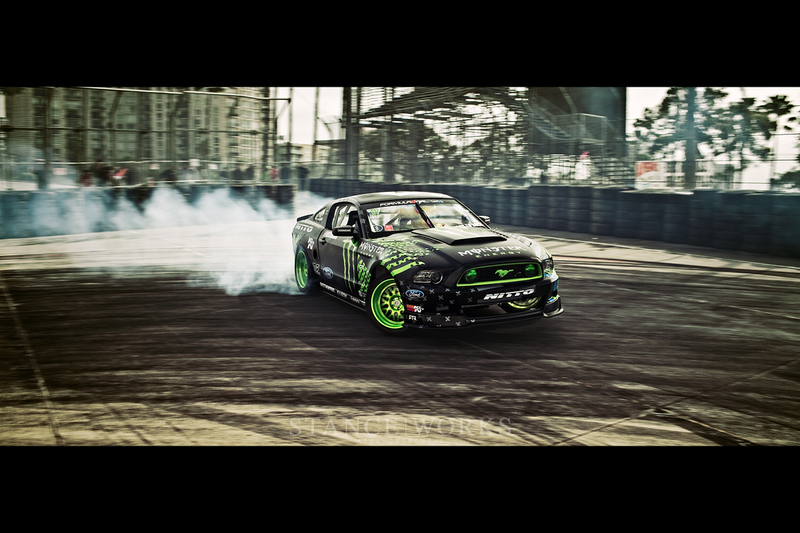 Gushi met the same unfortunate fate as well after he was eliminated by the powerhouse that is Vaughn Gittin Jr. The greatest battle of the day, and likely one of the best we will see this season, was between Fredric Aasbo and Daigo Saito. The two went head to head in a door-banging fight that was simply too close to call. The line, angle, and style of both cars was through the roof. The judges agreed that the two must make a repeat performance, and the cars were sent back to the starting grid. 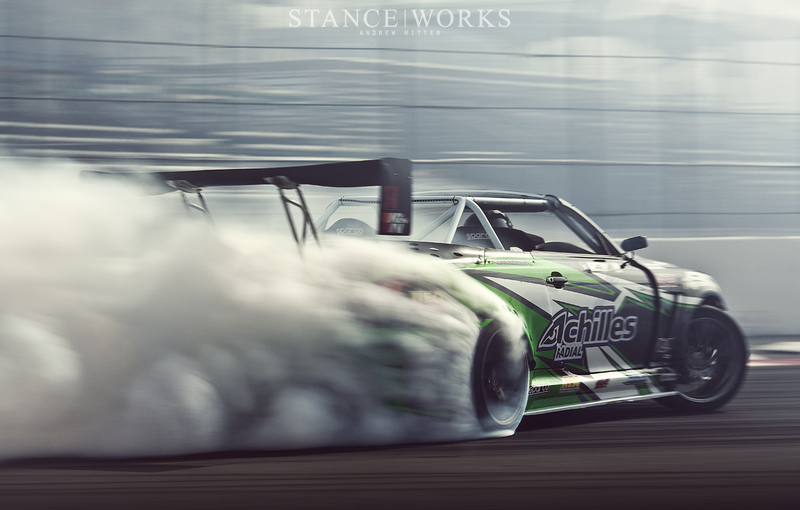 The sheer volume of smoke produced by these two cars put the rest of the field to shame. Both are notorious for their tire-roasting capabilities, and this show was unbelievable. In a somewhat surprising turn of events, Aasbo managed to take out the reigning champion, proudly showing what his updated rear-wheel-drive Scion TC is able to do with his talent at the wheel. 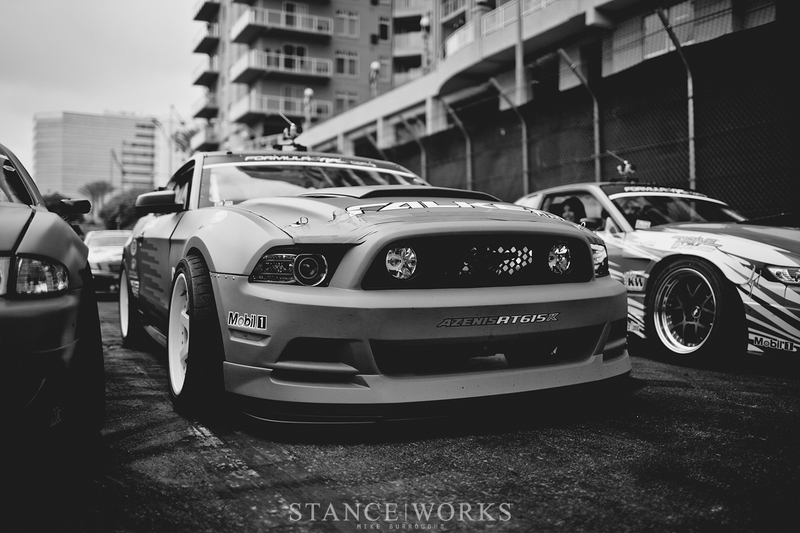 D-Mac's S14 and Pawlak's Ford Mustang were both eliminated, rather surprisingly. Chris Forsberg went against McNamara's 240, pitting Nissan against Nissan. 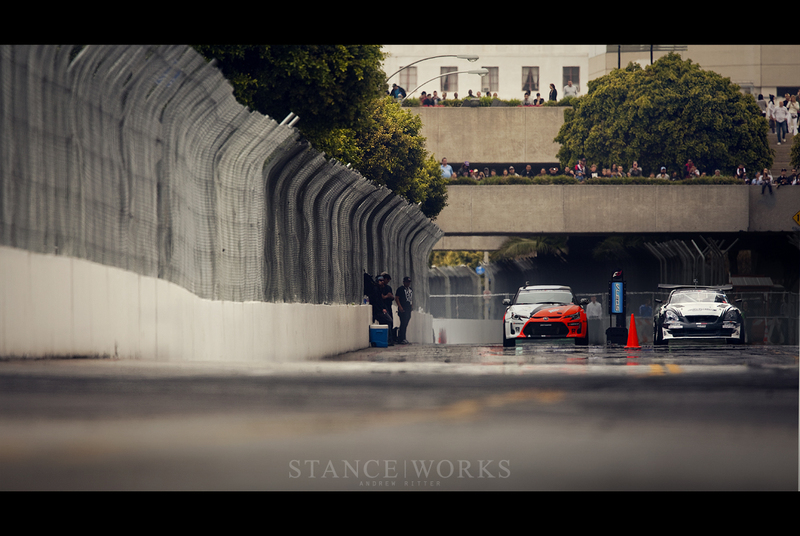 After taking the win, Forsberg found himself against Ryan Tuerck, whom had put up an excellent fight against Pawlak's Mustang. The Final Four remained - Gittin, Forsberg, Yoshihara, and to much surprise, Chelsea Denofa. 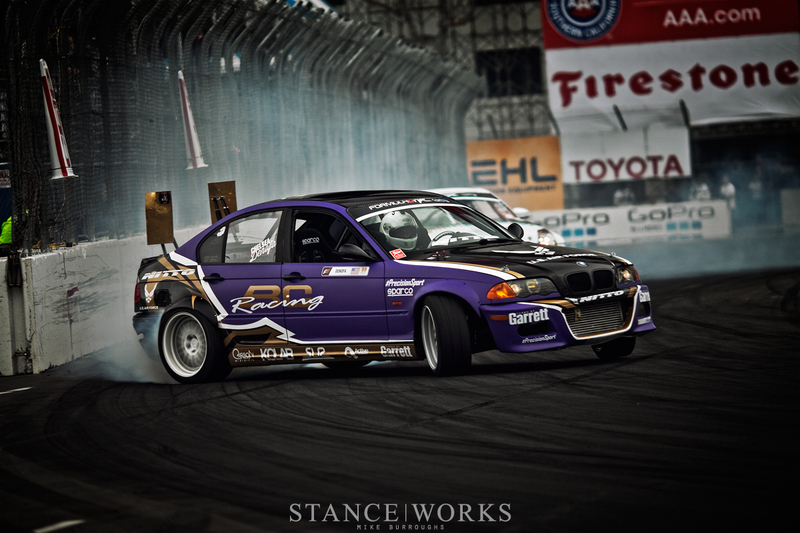 Back this season in the BC Racing/Nitto Tire turbo E46 Sedan, he managed to make his way to the very end. And he's only in his second year of FD. Was he lucky? Or are we going to be seeing more of him in this season's final rounds? 10-year veteran Chris Forsberg managed to knock Denofa out, landing him a 3rd place podium finish and 79 points to start off the season. Vaughn Gittin and Yoshihara remained for the final battle. 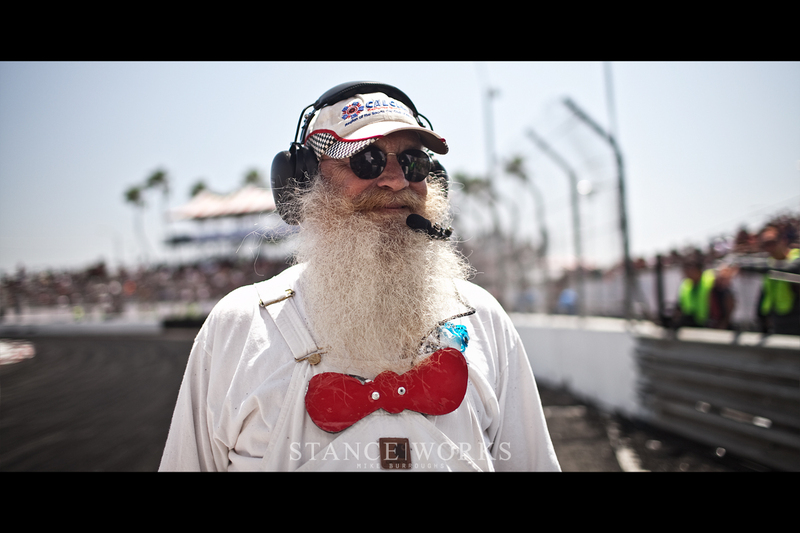 While I was rooting for Gittin to take the win, his infamous "Long Beach Bad Luck" had caught up with him - he took himself out of the fight after slipping up on the final turn of his last run. It was enough to give Dai the lead, and with that, the champion for Round One had been decided. 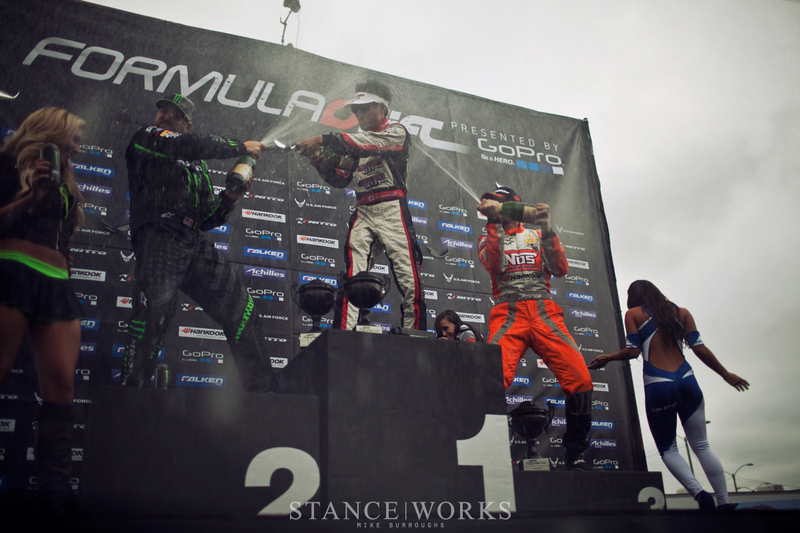 The podium was an impressive one - each driver has been a part of Formula Drift for its entire 10-year history. 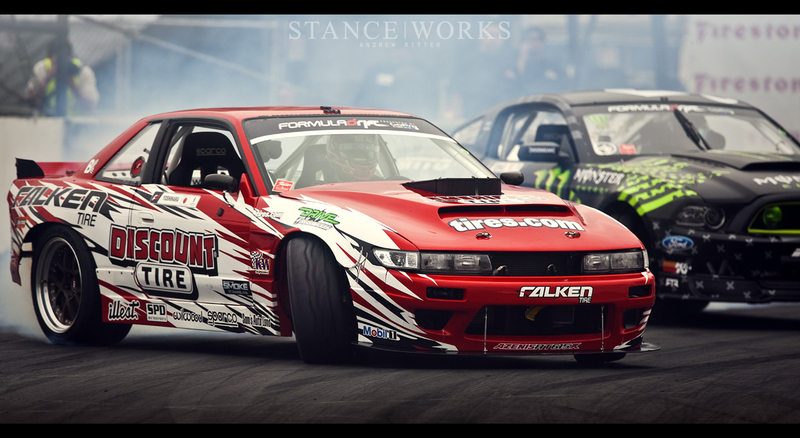 30 years of profession drifting experience represents the first podium of 2013. But with so much new talent on the field, the pace is sure to change as the year goes on. Awesome recap, and these photos are amazing! these photos are flawless- was seeing this on the live stream, Andrew and Mike – you guys are killing it with this set. Doesn’t Gushi’s frs swap out the fa20 for the ej25?